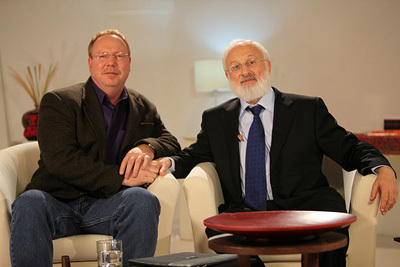 John St. Augustine, host of Oprah Radio’s John St. Augustine Show and author of Living an Uncommon Life and Every Moment Matters, talks with Kabbalist Dr. Michael Laitman about the growing dissatisfaction with life that a lot of people face, and how to bring a solution to this problem. Host: Hello and welcome to this episode of our series. As always, I'm joined by Dr. Michael Laitman. Dr. Laitman is Professor of Ontology and Kabbalah, and has a doctorate in Philosophy. He's the founder and director of the Bnei Baruch Kabbalah Institute. John St. Augustine: XM Radio. Host: ...XM Radio, thank you. He is a motivational speaker; the author of two books: Living an Uncommon Life and his new book Every Moment Matters. Host: Thanks for joining us. John St. Augustine: My pleasure, glad to be here. Host: John, a lot of the work you do is with self-help and motivation for people. Do you see a connection between that and what's happening in the world now? John St. Augustine: Absolutely, the reason they call it self-help is so you don't go buy books for other people, that your life is about helping yourself and discovering yourself; and being introspective enough to find your way in the world. We need influences, obviously, to steer us and put us in a direction, but ultimately it comes down to our voice and what we're going to do with our lives. To me, what I do on the radio and what the Oprah channel is all about, all the work that we do is about that. It's the awakening of the consciousness of people to be able to have dialogue that raises themselves up above their circumstances. Host: Have you found this has changed because of what is happening with the global crisis? John St. Augustine: No question. They say that circumstances don't determine who you are, they reveal who you are. The world that we live in now, the circumstances are changing so rapidly that we are being revealed more and more. Sometimes we don't like what we see, but we have to start to figure out what that really means for people because it's not going to change until we change. Host: What do you mean by "revealed"? John St. Augustine: Well, if you squeeze an orange, you get orange juice. Do you know what happens when you squeeze humans? I don't know either; everything can happen. To me it's about these pressures in our lives. I think they are there in some ways for a reason, to help us squeeze and find out what's inside of us so we can bring the best out. Host: Do you find that, too, Dr. Laitman, now as the pressures of the world are increasing? Michael Laitman: Well, yes, of course. We've come to a point where our ego has closed us in together so tightly that we can't move one without the other anymore. And the crisis that we are now experiencing is a global, integral crisis, where we are all connected in one system, and you really need some kind of help. We don't even know how we can at least alleviate our situation. Humanity is in a pretty tough situation. Host: You are saying that the problems we are facing are really being forced by us realizing that we are in one system? Michael Laitman: The situation is totally new; it has never happened before, this kind of state. We are always advancing using our egos that have been growing from generation to generation, even during our lives. It has prompted us to advance technologically, scientifically, psychologically. We were always building new societies, new regimes, new governments, and commerce. But today we are in a state, it's not even today, it's in the past few decades, where our egos don't let us develop further. It's kind of working to the contrary, against itself. Host: We sort of "hit the top," as high as our egos could go? Michael Laitman: Yes, because we have come to this kind of exhaustion or satiation maybe, some kind of culmination where you don't see where to develop further. Here we have problems of depression, despair, drugs, terrorism, and divorce rates; people don't know where to go. How else to use the ego, what else to achieve? We have come to this satiation, and there is no new way out of it. Host: Okay, so there are two problems; one... What do you think about it? John St. Augustine: I'm glad that there are only two problems because we can solve that in no time. Host: Well, do you agree that the ego has grown as much as it can? John St. Augustine: Well I think that it is an ever-expanding thing, and I think every time we come up with a new gadget or something outside of us, the ego gets a feed. As Dr. Laitman was explaining to me, we can keep creating more cell phones, and more things, and more stuff and feed that, but eventually it comes back to you. Eventually, that stuff always lets you down, and one way or another it's going to happen. So I agree, I think that we have gotten to a point where it has leveled off but it will always feed itself, and until you take away the source, it can't go away. Host: What do you mean by "take away the source"? John St. Augustine: Well look, the iPhones came out or whatever, whatever it is outside of us; six months later it's obsolete, so are you; you've got to be like somebody else in order to fit in. We find all these ways to fit in with other people, but we don't connect with them. We want to be like them. Look, I have a teenager and they dress the same here in New York, as they do in Michigan, as they do in Chicago, but they don't know why. They want to fit together, but are they connecting? So it's great to be pushed together by similar technologies or fashion or whatever, but are you connecting within the circle that you are being pushed together to? Host: How do you overcome that and get people to really connect? John St. Augustine: You listen to shows like this. I am serious. It's like going to the gym and working out; you have to do it over and over again. I believe at some point in our lives, either you push yourself towards it, or the universe will push you towards it. You'll have a break - an illness, a divorce, a loss in business, a death in your family - and all of sudden, the ego takes a hit and you say, "Wait a minute, maybe something else is out there that I didn't realize"? Host: Dr. Laitman, do you care to comment? Michael Laitman: We find it very difficult today. As John said correctly, the new technologies that were so trendy and so appealing in the last decade, computers, now iPhones, and whatever else; today, we see in advance that it is not going to satisfy us. We become experienced that it is going to be over soon. Host: What is the answer? Michael Laitman: The answer: There is nothing drawing me forward and pulling me. We have to search for a new goal, but a goal that will not be like previous goals: another car, something else that is more sophisticated, a new gadget. We see that it is not worth the effort; I'll be disappointed anyway. Host: How do we break this cycle? Michael Laitman: We need a method, a new method of fulfillment. Previously, we satisfied ourselves by purchasing, acquiring, buying, and receiving too. Now we see that as much as I stuff into myself, it doesn't satisfy me anymore; on the contrary, I become emptier. So we need to search for a new method by which to be satisfied. Kabbalah explains that it is possible only by being like that fulfillment. In other words, you have to be filled through others. That's why today, in our world or in our society, we are discovering we are connected, and that gives you a chance to be satisfied through others. Because we are connected like a family, by extending yourself, and along with everyone building a large society where everyone is connected in the right way, that gives the chance to be satisfied; not because you are satisfying yourself, but because you are helping fulfill others. If you are with them in one society, one bonding, kind of in a state of love, and participation, it fulfills you. Host: Explain the right kind of connection. What type of connection are you talking about? Michael Laitman: It's like a family. We all have families and we enjoy giving to our children more than taking for ourselves, right? It gives me greater pleasure if I give something to my child than if I get it for me. That's what nature forces us to do because it gives us natural love for our children. If we acquire that same kind of love toward others, we'll be able to enjoy indefinitely, and by giving to others, I'll be enjoying. The pleasure is what counts; that's the feeling of life. Now I think, how am I going to please others? What does that give me? But if it gives me satisfaction, all the better. John St. Augustine: The concept of the human family is what he's talking about. John St. Augustine: When you are getting to the point of the human family, that kind of consciousness, that's when things change. It's okay to have things, but it's not okay when the things have you. When you are chasing them, and paying for them, and trying to make all that work and hold all that up, it's very difficult. We've seen recently here in the United States and around the world, the economic downturn really knocked people for a loop for a lot of reasons. Because they started to see that "maybe I'm not that stuff." I think, as you pointed out, what is it going to take, what is the break point? It's already here. We are already at a point where we wrote over thirty million prescriptions for Prozac in the United States last year. Something is not right. We have more than any other society has ever had since the beginning of recorded history, and we have no idea of who we are or why we are here. That's the only two reasons I think we are supposed to come up with answers: Why are we here and where are we going from here? I think at this point, with the technology and the population, and all the challenges we face, this is the greatest time to be alive. Host: When I think about that guy over here, or that guy over there, like my family, I don't know whether my system could take that. I think sooner or later I would explode if I'm worried about that guy like I'm worried about my child. John St. Augustine: I don't think you have to be worried about anybody. I think it is just about conscious awareness that they are part of that. It doesn't mean you have to have them over for dinner; Seth; it just means you knew that they have dinner somewhere and that's okay. Go to Australia and mothers cry about things in Australia like they do in Chicago, like they do in New York. There are similarities that we all share as our strength, and it's our differences that make this the unique tapestry that it is. I think being aware of that, as opposed to saying you are different than me, realizes that we are much more the same than we are different. There's a lot of power in that. Host: We see what's going on in the world. We see what's happening with the financial crisis, for example. Now people are talking about all these green shoots. Do you think that things are, actually, getting better on the financial side? John St. Augustine: If you always do what you've always done, you'll always get what you've always got. We've had these cycles since we created this kind of society. So how do we go about it different this time than we did in 1980 or 1965? These are cycles; they are predictable, in and out, because they are based on our behavior. It is astonishing to me that we don't realize we make this all up; we made the whole thing up. You know why gold is what the value of it is? Because somebody said so, that's it. You know why fuel costs what it did? Because somebody said so. Somebody speculates, somebody decides, there's a belief, enough people join in, this is what this thing costs. My dad's first house was eighteen thousand dollars. When he passed away it was over a million. Why? Because people decided this is the way we are going to go; we've all decided this. So, an awakening of we're repeating these cycles and we are getting kind of tired of it; maybe we should do something different this time around, be something different. Host: Do you think it will get better based upon the system that we've created? John St. Augustine: Of course it will. We are not doing anything different. We'll build it back up; the housing market will go back up, for example in this country, and then something else will happen. And then we'll go through it again and we'll wonder what are we supposed to learn here, unless we change the way we go about it? Host: Dr. Laitman, what do you think about these green shoots that we keep hearing about? Michael Laitman: We need to discover that the problem of the crisis is the human element, something that's really never been as dominant as it is today. So if we don't change ourselves now, our attitude toward others and toward the global nature, just like the integral and global nature is in harmony among all of its elements; similarly, we need to be in harmony with the rest of nature. We are the only element in nature that is in opposition, through our egos, to the whole of nature. We want to use, we want to exploit, we want to use everything for our egos, and by that we are breaching the harmony and the balance. We have to know the law of the oneness, of the equilibrium, of the globality. That's why now we are in a new era. We have to process it, and we still don't understand to what degree it is different. It's a new era of evolution where the ego era is over and it's closing in, and now we are in a new system. Previously, everyone tried to be a hot shot, the higher you were the more you suppressed others, and you succeeded. Today's success will not be dependent on that; it will depend on the extent to which we can bond with each other. Host: If a person subscribes to this view, how would a person change his life to make this happen today, how would a person do this? Michael Laitman: We are going to have to change. We are going to have to change the philosophy of our lives, our approach to life: to business, to human connections, to everything. Our approach is constantly by a simple formula: maximum reception, minimum giving; and it doesn't work today. Maybe here and there to an extent, but we see that these things are ceasing to exist. Host: But are we all supposed to be like you? You have dedicated your life to getting this message out. Are we all supposed to drop whatever we are doing and dedicate our lives to...? Michael Laitman: Well, if we are all connected in an integral system, what are you going to do? Everyone will have to take everyone else into consideration. That's inconceivable. I do some business with you; yes, you're a businessman and say I am a businessman, so we do some business. Now, theoretically, we have to know what kind of change in the business between us we're going to affect in the whole system, so it benefits the whole system. Only then, the positive results for the system will come to us as a profit; otherwise, it won't work. Where are we going to get this analytical mind, this kind of perception, this kind of broad vision? Who can even calculate that? But we are discovering that it's a big problem. John St. Augustine: I have the answer; it's really simple. There is a kinesiology term, the study of the human dynamics of the body, the movement of the body, called "S-A-I-D": specific adaptation to imposed demands. And so, when you work out, that's why Arnold Schwarzenegger would look like he'd look, and a figure skater would look like they would look, and a track person would look; their body has adapted to the demand placed on them. The demand we have placed on the planet is starting to show what we have done to it. To change that - "you always do what you have always done, you always get what you have always got" - you start going backwards. Most people I know get up about the same time, drive about the same way to work, wear about the same clothes, use the same places; everything's the same; and until you change the demand on them, there is no adaptation. I tell these people, if you want to change your life, if you really want to make a difference, drive a different way to work. Michael Laitman: But it happens through blows, through blows, through pressures. John St. Augustine: Yes, it's happening anyway. Michael Laitman: How do you make that transition? No, I understand that; that's beautiful. But how do you make the transition softer, easier, because we are talking about masses of people, ordinary people. You are right. We want to make it sweeter. John St. Augustine: But I don't think you are going to get masses. Critical mass is important, the Macarena, case in point. But to me, when one stands up, permission is given for the others to stand up. When I do radio, there may be millions of people listening, but I am only talking to one because I realized that one person can be listening, millions can be listening, but one is hearing: big difference. That person hears what we are talking about, they apply it to their lives, they literally can become the ripple effect in their community, their home, whatever it may be. So getting masses? I don't know about that. Getting one? I know about that. And that is doing something different from what you normally do, so that you see the world different, and you realize you are part of the whole and not outside of it. Critically important. Host: Do you think that is enough? John St. Augustine: That's important what you say, but you have to love yourself. Look, you can't give something to someone else that you don't have. I don't think most of us feel like we belong here, that we should have this world that we live in. Until you feel connected to that kind of feeling, you can't go and give it to anybody else. So to me that is why that inner core you talked before about evil and is that... you have to get past that to realize you are not a cosmic burp, you are not a mistake. You are here for a reason. You are here to find out what it is, where have I been, why am I here, where am I going? Asking yourself those questions, it's far better than saying, "What's for dinner? Did I win the lottery?" because then it can't change your life. Host: It's funny you say that because the question that he just put forth is the question that I have heard you say before, "Why am I here, what is our purpose here?" John St. Augustine: This is a very smart man, that's why. Michael Laitman: But how many people are there who ask that question? But even other people have to know that even when they don't ask existential questions like the purpose of life and what is it all for, just to survive in the world, and to sustain themselves in a dignified way like we all want to, we have to start being considerate and build good human relations. It's the system that forces us to. John St. Augustine: I think that we are a 50/50 species. I think that the human part of us, not so good; the being part of us, divine; and I think that is the eternal battle. My thoughts have always been.... I have spoken in prisons, I have spoken in the worst places you can think of, and I see that they went towards evil, if we are going to call it that because they didn't realize their DNA, which is their divine natural abilities. Once you add that to the mix, then the evil, the negative, the darkness, it doesn't stand a chance, if you stay with it. There is an old story, I am sure there is in your tradition as well, of a Native American gentleman, or the grandfather who is speaking to his grandson in the lodge. The grandson comes in and says, "I had a dream last night. In the dream there were two wolves inside fighting. One was a black wolf and one was a white wolf. The black wolf scared me grandfather, and the white wolf made me feel hopeful. Which one will survive?" The grandfather said "The one you feed the most." To me that is the nature of humanity, the nature of humans, as we have both, which one we feed the most is the one we will see in the world. Michael Laitman: But for that, I have to have the right society. All the changes in us can only happen through the environment, and we can see that. In whatever environment we grow, we arise as a result of the environment. So we can't really come complaining to a person about why they do this or that, maybe bad things, but we really have to look at where they came from. The main problem of humanity today is education. If we want to see happy people and a better world, we first and foremost have to see about how to build the right environment that will affect people positively. The right environment is the media, the education system in kindergartens, schools, universities, but especially the media. Host: Dr. Laitman, what happens if we don't start changing the environment, in your view? Michael Laitman: We are just going to suffer blows, serious blows. Until they nevertheless, force us to open our hearts and minds to what's happening in the world. We have to be aware of nature's changes. Now we are in a situation that the use of the ordinary ego, the way that we are used to - I want to use you and you will use someone else, etc., etc., and the survival of the fittest and all that - these things are over now. If we are talking about the integral law, the integral system, we have different laws working there. Unity works there, bonding, participation, consideration between parties in a single system; and not who is stronger, suppressing the weaker. In our bodies there is no such thing. If humanity is like a single organism, you have different rules playing: rules of consideration, unity, and bonding. We need to teach the new generation about these laws. John St. Augustine: I think some of the biggest environmental challenges we face today, all of us face, is that we don't feel connected to this planet that sustains our lives. I find it fascinating. Twenty years ago I was doing talks on the environment. I'd say, "Here's ten things you can do today to make a difference." They'd say, "Well, I don't like any of those. Do you have anything else?" And I realized, you know, if you go to a party at someone else's house, you never clean up do you? You always leave. Until you feel connected to this amazing little blue marble we live on, why would we take care of it? I think that kind of connection is paramount to the concept of the human family, paramount. Michael Laitman: Yes, that's true. The problem is how do we all understand it? That is the problem, because for now a very small part of humanity understands it, and that puts us in a big problem. We are not going to resolve the crisis and the problems that are now occurring until we understand it and start moving toward it. Host: Well, I think it's really two steps. I think it is educating people, and I also think it's a question of how to get the message out further to people who are still at that stage of advancement where they are just thinking about themselves. John St. Augustine: Well, that's why I think radio is so very important. I mean that is a very good point, because you have to know who you are first to be able to go out to do the work you are going to do. I think that is what self-empowerment, self-improvement, self-help is all about. But as Dr. Laitman was pointing out, the universe, the world, is going to push you and mold you until you become that, whether you like it or not. You don't have to like it, but that is what evolution is. I say in life you can do one of two things. When I was a kid in Chicago, my mom would take me to Sears and we'd go in the revolving door. That's fun when you're seven, but it's not fun when you're forty-seven. So it's about evolution, not revolving all the time, and breaking free from the past that you had, your parents had, that they had, and becoming that new person, and then bringing it out to the world. Host: A very interesting quote. Michael Laitman: I am going to use that example. I like the revolving door. Thank you, beautiful. John St. Augustine: You can use it. Host: With the attribution or without the attribution? Evolution or revolution, evolve or revolve? John St. Augustine: What's left? Either we are going to keep doing what we've always done, and I finish every one of my shows on the Oprah channel with, "If you always do what you've always done, you'll always get what you always got," it doesn't matter if you're working out, weight loss, relationships, your job; I don't care what it is; if you always do the same things, to think that the result would be different is why they lock people up. It's about the being this and the doing this, the result is different. Host: Let's recap. We are in one system in which our thoughts, our intentions are what can influence that system, and if we influence that system in the right way, change will start to happen. Correct Dr. Laitman? Michael Laitman: For the better. John St. Augustine: There is no question; as he put it earlier, the human body is like a mirror of the world. Every one of us has cancer cells, but some get it and some don't. Some people take care of the body and some don't. You can tell what they're eating because you can tell how they look. When you look at the world we live in, it is a reflection of the micro to the macro and the macro to the micro. The world is a reflection of what we've done to it, who we are, and what we see it as. Host: I am very envious of both of your work because you are both touching a lot of people in an extremely positive way. I want to thank our guests today John St. Augustine, Dr. Michael Laitman. John St. Augustine: My pleasure.